Here’s a great and visual easy magic card trick where you cause a playing card to apparently float in air as if it’s levitated or suspended above your hand. You can easily make the gimmick yourself and perform the illusion by following these step-by-step instructions. This easy trick is particularly good for beginners and kids as it requires no complicated moves. You bring out a deck of cards. You grab the top card and raise it up and move it forward slightly. And when you let go of the card, it stays suspended in midair. You then grab the card and bring it back to the deck and bring your spectators back to reality, real sleight of hand required. The card floats courtesy of a gimmicked card that we show you how to make. glue (a glue stick works great). Since we're using Bicycle cards, we used the scissors to trim off the white border. This is probably optional but we think that the gimmick fits better on the card when this step is taken. Cut this cut-down card into thirds lengthwise. You’ll have three strips of a playing card. Fold each strip into a “z” or zigzag shape. Make sure that the middle sections are the same length. An easy way to guarantee this is to fold all three strips together. You’ll end up with three “zig-zag” or “z” strips. Glue the first and third sections of each “z” strip onto the other two cards as shown in the image. This picture should make clear the secret of the trick. By raising and dropping the top card, you can appear to make it float, but it’s supported by the “z” strips. Push the top card of the gimmick down onto the bottom card, folding the “z” strips, and flatten the gimmick. Place the gimmick on top of the deck. You will have to hold the top card down to keep it from rising. You should appear to be simply holding a regular deck of cards. Grab the top card (it’s the top card of the gimmick) and lift it up and forward. When the “z” strips have unfolded a bit, let go of the card. It will appear to be floating in air. Only allow the card to be momentarily shown as floating. Grab the card and bring it back down onto the deck. Watch out for viewing angles. You’ll have to make sure that your spectators are standing around you and looking down at the cards. 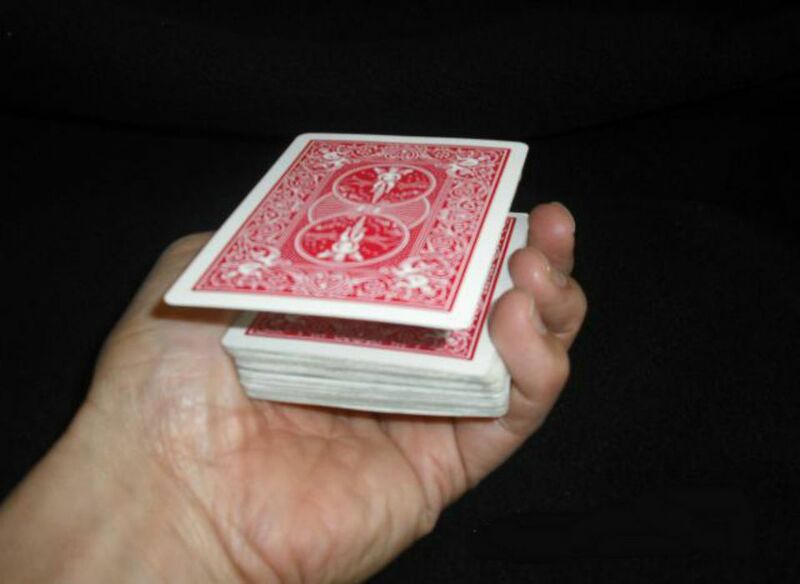 If the cards are held near their eye-level, the trick will be exposed.